In 1986 moved to Montevideo, Uruguay, to study with Abel Carlevaro. 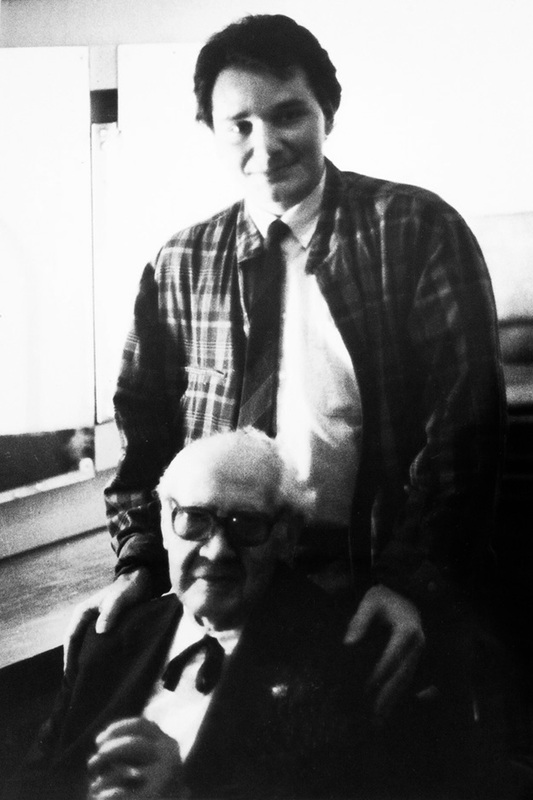 Maestro Abel Carlevaro had a significative influence on Renato's playing and Renato considers him "the most influential teacher in my career". In 1988 studied guitar and harmony in London with Bernard Oram at the Guildhall School of Music and Drama. Has produced 4 CDs and a guitar video. 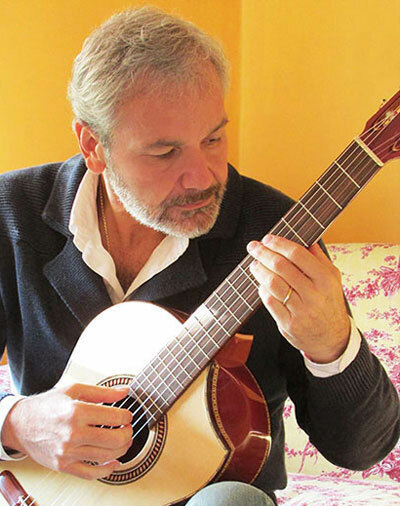 He teaches guitar privately in Asuncion to students that come from all over the globe. Through his website, Renato teaches to thousands of students in practically every country on the planet. 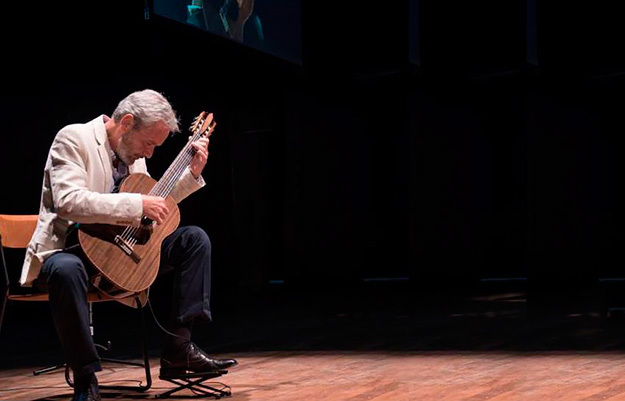 In 2004, Renato created his own classical guitar brand and, working with the best luthiers in Paraguay. Renato started offering Hauser, Lattice braced, and Double top concert guitars. The adding of his many construction innovations have established Bellucci Guitars as one of the most wanted and affordable instruments in the guitar community. Renato has a BA degree in English and is fluent in English, Spanish, Portuguese and Italian. We would talk for hours at a time and I could tell from his words that he was at peace. One memorable Sunday he invited me to attend Mass near "Plaza Mayor" at an old Baroque Church, on one of those Madrid streets that seem to be suspended in time. It had been a long time since I had last attended Mass, but I could never say no to José because he earned my complete trust through a deep friendship. He even told me that a great Spanish organist played Bach there on Sunday's Service. How could I possibly say no? We arrived 10 minutes early and we could hear those majestic chords echoing through the narrow streets 3 blocks from the main entrance to the Church. You can only imagine what it was like entering what seemed the "ultimate cathedral", my nostrils filled with candle and my sight and ears totally ecstatic. I was still daydreaming around when José got on his knees and put his hands together. I was beginning to understand what no words could have explained better. I would have liked to imitate José but all I could imitate was his posture, not his intimacy with the Almighty. I wanted to ask him so many questions but it would have been a sacrilege to interrupt him at that point. I turned around and saw the pipes of this 17th century organ and an unforgettable Toccata coming out of them. I felt simply great. A priest was confessing at the far right end of the Church and he must have seen my mixture of indescribable wondering. He made a gesture with his hand like saying "the confessionary is available". I walked the 20 steps towards the confessionary and a thousand things must have gone through my mind. I knelt and told the Priest, "Father I have not confessed in over 5 years, I came with a friend, I am a musician... I come from Paraguay...but I'm Italian....", I had just finished muttering these words when he interrupted me saying "Do you practice many hours a day? ", I answered "...yes Father I do", he said these words which would forever change the course of my life : "Offer every hour of your practice to God and you will be giving glory to God, sanctify your profession because that is what God calls you to do". Today, more than 26 years after, I still go back to those words and hold on to them, and they comfort me more and more with each passing day. During my 42 years as a guitarist, I've had the chance of studying with and meeting some of the best known guitarist of all times. The guitar pictures that follow, immortalized some of my life's greatest moments. This page in not meant to be just a display of classical guitar related pictures but a place where I share some historical moments in my life as a classical guitar student, performer and teacher; moments that many of the visitors to mangore.com can relate to. 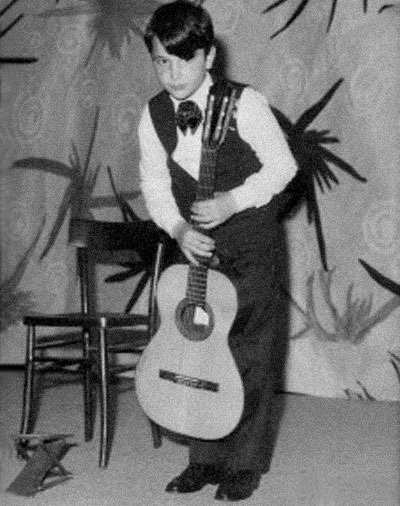 My musical career started when I was 8 in Taranto , Italy. Today, 15,000 Kilometers to the South in Asuncion, Paraguay, I am celebrating my 42nd anniversary as a musician. Paraguay, a beautiful country I have first visited in 1974 when my parents came to visit an uncle that lived in Brazil. Paraguay had a deep impact in all the members of my family and although we never thought we would live here forever, 36 years have passed and it sure does not look like I am going anywhere. My parents have gone back to Italy in 2006. I decided to stay here and as long as my guitar teaching website and guitar manufacture workshop permits, I intend to stay for good. Still, I am old enough to have learned that "for good" is one of those clichés that often miss the target. I must stress one truth... Segovia was the greatest guitar figure that ever lived. Mostly because he had to pave a way for an instrument, the guitar, which was mostly unknown to the great public at the beginning of the 20th Century. Segovia "pushed" many young players careers who attended his famous Santiago de Compostela (Spain) and Italian (Siena) masterclasses. And, sadly, literally pushed many players careers to an abrupt end. Few musicians, not to say none before or since, had such a profound impact on their instruments as Segovia did in the classical guitar world. A picture can say a thousand words, those moments with the great maestros have changed my life forever. In the guitar picture taken in Segovia's studio in Madrid during a private lesson (image below), I was playing one of Bach Bourree in B minor. 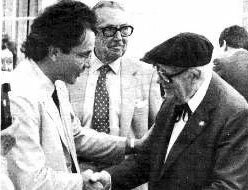 Renato Bellucci with Andres Segovia, Madrid 1984. My hands were cold and moist. The maestro took his chance to give me a little advice... "before you start playing, try doing what I do before playing in concert. If your hands are cold, take your time to warm them. I once asked for a thermos with hot water before playing in a New York winter concert and warmed my hands with it for almost 10 minutes... the public had to wait ten minutes more for a much better performance..." As people grows older, they also grow philosophical. It is difficult to put into words all the feelings, sensations and impressions that such a colossal moment means in a young guitarist's life. I was 22.... fresh out of Conservatory with my first major guitar competition won and a whole life in front of me. In 1983 Segovia was to me the most important figure on the face of the Earth. I remember getting out of the elevator with my guitar case to then walk the last few steps to access the attic of this mid size and few stories building where Segovia had his Madrid apartment on one floor and his studio right under the roof. I heard the locks to this huge metal door open (more like a safe box door actually) as my heartbeat started accelerating with anticipation. Finally the door started opening and the figure of the greatest (and oldest) guitarist alive started appearing before my eyes. The master made a gesture as he was saying "Adelante Renato" to make me welcome. I did not know whether to make a reverie, kiss the hand or simply shake hands as I ultimately did. I wanted to pinch myself at every step I took towards the heart of the studio. "So, this is what a Studio looks like?" was one of the thousand thoughts crossing my mind... several guitar cases were visible on the right wall and Segovia's practice setup took a good portion of the room. 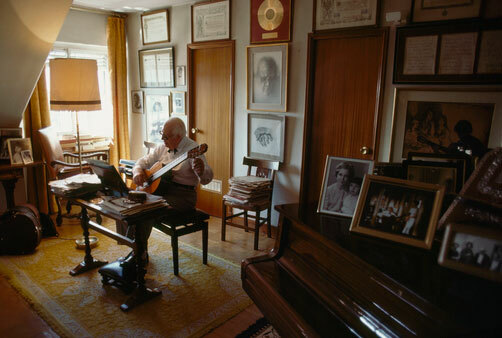 Segovia practicing in his Madrid studio at age 93. The picture on the left was published in National Geographic magazine in 1980. The picture was taken by my good friend National Geographic photographer Lou Mazzatenta during a photo shoot for the prestigious magazine. Segovia's studio looks exactly like the picture above. Only 2 things are different: 1- The photographer, Lou Mezzatenta, put a small blanket on the window to avoid the light from spoiling the picture 2- Segovia always practiced in his bathrobe and the sleek outfit is only for obvious photographic reasons. If you look at my picture with the maestro (above) you will see him in his " regular" outfit. The place where my picture with the maestro was taken is just to the left of the guitar cases on the floor in the lower left of the picture. A small TV is there along with an intimate living room. I was speechless and I sincerely did not know if I was going to be able to move a single finger. I was about to play for the master... my childhood Idol! I took a deep breath and started playing... The atmosphere was magic and I never thought the human brain could deal with so many things simultaneously... the hands moving around the guitar, my imagination running at 1000 miles an hour, the overwhelming feeling of achievement and of course, keeping me alive. I played the last chord of the Bourree and after a few seconds of silence Segovia extended his right hand and shook mine in a good job kind of way... He was certainly not the kind of master to be impressed very easily and neither was it my objective. He proceeded to explain some of the passages in the Bourree and how he went about transcribing pieces. He made a point saying that he would transcribe only if the piece was going to shine as bright or brighter than on the original instrument. Everything he explained was accompanied by very wide gestures of his arm and hands. The next thing he did was to look closely at my guitar. I took a Contreras double top for Segovia to look at and give me his opinion on the double top Contreras was developing at the time. Segovia looked at the guitars from all possible angles and I was marveled at the way he handled the instrument...after all Segovia and guitars had been having a 90 years affair! He gave it back to me and told me to pass him one of the guitar cases that were on the right wall of the studio. He liked the poetic sound and admired Contreras vision of the double top. The first great maestro I had the chance of studying with when I was living in Spain was Narciso Yepes. in Las Rozas, Spain 1984. A small man but a great human being. I had to travel 50 kilometers to his Las Rozas home. He was an innovator. To start out with, he had a 10 strings Ramirez guitar built on request. In the picture I'm playing Barrios' "Una limosna por el amor de Dios"... he had never heard the piece. Immediately after I finished playing it, he said "your tremolo is very smooth and "christaline", I seldom like a piece the first time I hear it.. let me see if I have the music sheet in my collection.. I'd like to play that piece in Italy next month". These words, coming from the one man who renders tremolo at its best were definitely a boost to my young ego. Later in these pages, I will elaborate more on the word "influence". The one maestro that influenced me the most is undoubtedly Abel Carlevaro. 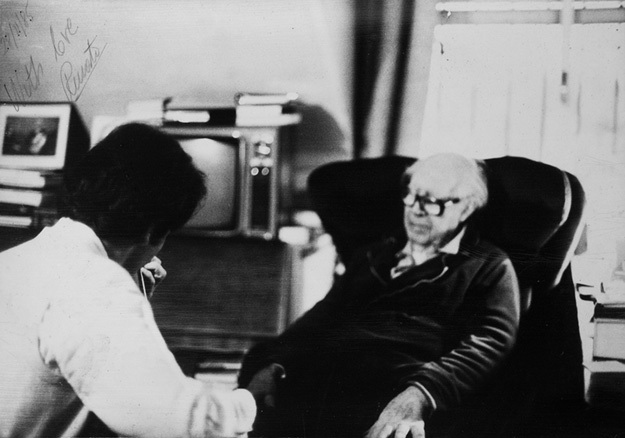 Renato With Abel Carlevaro, Montevideo, 1986. 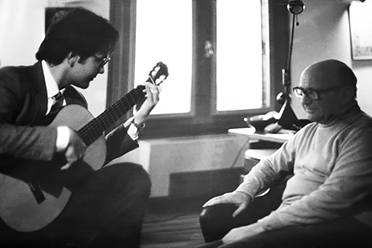 Renato Bellucci with Andres Segovia, Madrid, 1985. Renato Bellucci with Andres Segovia, USC, LA, 1986. Maestro Abel Carlevaro, who recently died in Germany during a concert-masterclass tour, was an innovator in many ways. 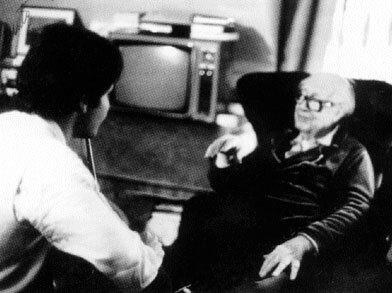 In this picture taken by his wife in his Montevideo apartment, he was telling me he would take me as his student. 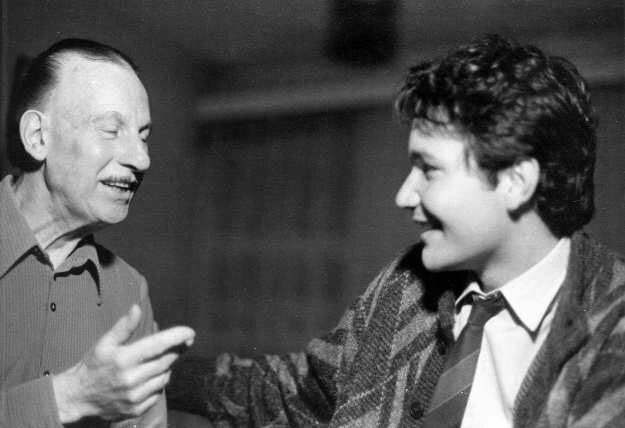 I was living in Spain at the time, and moved to Montevideo where I studied under him for a year. Read more about Carlevaro, clicking here. I always say that Carlevaro would have been a great interpreter no matter what instrument he had chosen. He thought me to think for myself and, being his technique the result of years of inner searching, he would not deprive me the same "pleasure". He told me during one of our lessons "Don't do anything I tell you to do unless your brain agrees". After only 6 months with the maestro, I ordered the famous "Manuel Contreras- Carlevaro Model guitar". I only gave her up when I started building my own concert guitars. The following pictures were taken during the famous Segovia Masterclasses at USC in the summer of 1986. Everyone seemed to be there. Christopher Parkening was blending and sharing moments and signing autographs with a truly bright and honest Jn 3:16 beneath his signature with every young player with the greatness and simplicity that has always characterized him, Michael Lorimer, Marcelo Kayath. At the USC masterclasses with Segovia, I remember Marcelo Kayath listening to Yamashita perform Pictures at an exhibition in his Walkman. Suddenly, he would remove the earphones and tell me and the other guitarists (Lily Afshar, William Kanengiser, Scott Tennant, Mary Akerman) in the dorms common area : "Unbelievable !! He's (Yamashita) playing tremolo using the little finger alone !" Coming from the most impressive player of the 80s, the comment was definitely worth looking into. 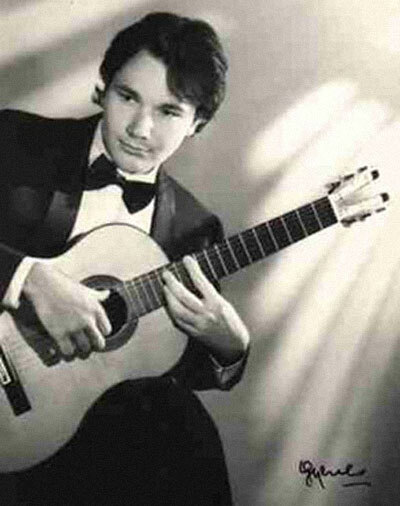 Remember that Yamashita had just ripped the guitar world in Toronto with his terrific interpretation of Mussorgsky's Pictures at an exhibition and Kayath had just won the Toronto and Radio France guitar competition in the same year... a feat believed to be impossible to attain. That would be the last time I saw the great Spaniard... he died 6 months later due to pneumonia. His last words to me were "...so, Renato, always in love with the guitar?..." and I exchanged a glimpse with the maestro as he was getting in the car. My greatest advice for my students and friends is to have, live and die for a dream. Simply make sure it is the "right" dream. Great maestros are looking for great strive on their students' part. No great teacher is far enough for a real pupil. Renato Bellucci live at Gramo, Paraguay, 2013. Above is Manuel Contreras with me in his guitar shop-studio 1986. To the right it is me in 1969. My first public performance. Di Cagno Abbrescia School (my elementary school) in Bari, Italy. Just a few weeks before I watched as Neil Armstrong set foot on the moon. Two weeks after the Di Cagno Abbrescia recital, I played at Teatro Piccinni in Bari. The way I felt that first time on stage is exactly the same way I feel today... 34 years after. 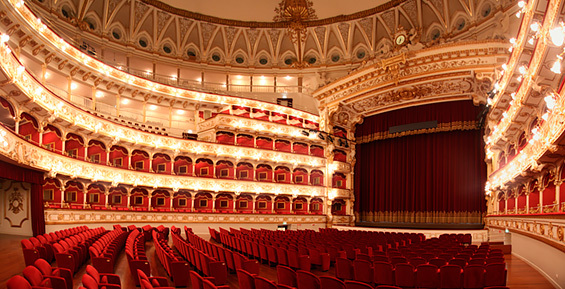 The picture below is a view of Teatro Piccinni from the main stage. I made my debut here at age 9. 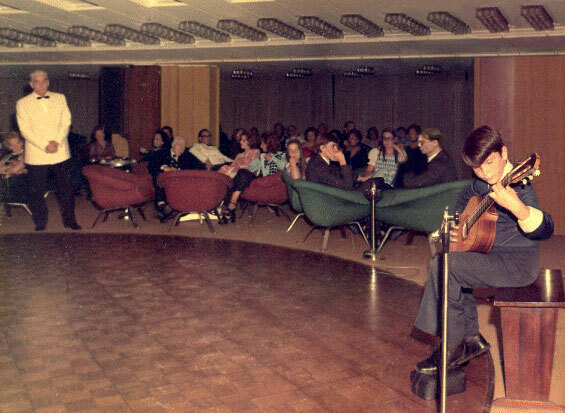 Renato playing on Cristoforo Colombo, 1970. This recital was a turning point in my life. It was a short 3 pieces recital on board the transatlantic Cristoforo Colombo. I was asked to play to celebrate. The ship was passing through the Equator that evening. A Flamenco player that was staying 2 rooms from mine, heard me practice in the mornings and told the events organizer (man in white) about my skill... I realized for the first time the awesome power that a musical instrument has over our fellow human beings. The wood box with its 6 strings and my interpretation as a 9 years old boy, kept 300 people of all ages in absolute silence and hypnotized. The girl I was Platonically in love with finally had her eyes for me only (She's the girl holding her chin with her hand at the center of the picture above)... I knew then that the guitar was to be a part of me. One hour of daily practice was simply nothing in exchange!